Your dog is your best friend and goes the extra mile with you - even when it comes to high performance activities. Eukanuba Adult Dry Dog Food Premium Performance nutrition gives athletic and active dogs the right energy so they can perform their best in everything they do. Eukanuba Adult Dry Dog Food Premium Performance Working & Endurance is the right dog food for working dogs that spend a lot of time outside and need to be alert and energetic over a longer period of time. Hunting, patrol or rescue dogs reach a sustained energy peak performance with our highest levels* of protein (30%) and fat (20%). This enables them to build strong, lean muscles and keeps them ready to take on any challenge they encounter during their work with you. The energy levels achieved by feeding this healthy nutrition also support pregnant and lactating females to stay strong and take best care of their puppies. Nutrients like omega-3 fatty acids for good nose and scenting ability make sure your dog finds his way to securely accomplish his tasks. Formulated with prebiotics and clinically proven beet pulp, this high quality food promotes digestive health and optimizes the absorption of all important nutrients. Calcium for strong bones and clinically proven antioxidant for strong natural defences keep your dog active and athletic so he can always focus on giving his best. Since you want your best friend to be great on the inside and look extraordinary on the outside, this adult dog food contains an optimal ratio of omega-6 and -3 fatty acids to promote a healthy skin and radiant coat while they also help to reduce shedding by up to 80%**. Eukanuba Adult Dry Dog Food Premium Performance Working & Endurance uses 3D DentaDefense technology, which cleans your dog's teeth with every bite, reduces tartar build-up by up to 80%*** and helps your dog maintain strong teeth. 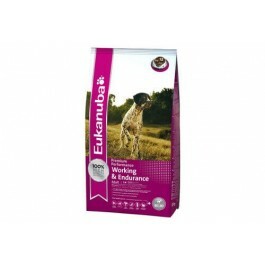 This working dog food was developed with veterinarians and is recommended by top breeders. It is 100% complete and balanced to help your best friend perform as extraordinarily as possible together with you - at any time and in any situation. 1 Endurance + - Our highest levels of protein (30%) and fat (20%) for peak performance (for adult dog). 3 Smell - Promotes scenting ability. 4 Power - Clinically proven to help support lean muscles with animal proteins. 5 Dental - Clinically proven to reduce tartar build-up in 28 days. Reduces plaque and maintains strong teeth. 6 Defend - Helps promote strong natural defences with clinically proven antioxidant. Dogs who have high levels of exercise through working and field trials need more than everyday nutrition to maintain health and stay at peak performance. The same is true for dogs that are pregnant, in lactation or those that are underweight. Feeding your dog: When feeding for the first time, gradually introduce Eukanuba into your dog's diet over a period of 4 days. We recommend feeding your dog twice a day. Divide the daily amount shown in the chart by the number of meals. Your dog eat more or less depending on age, temperament and activity level. For pregnant and nursing dogs: During the last three weeks of gestation, increase feeding amounts by 25% to 50%. During lactation, feed as much as she wants (usually two to five times the guideline amount, depending on litter size). Always have plenty of fresh water available for your dog to drink.